I see that there are at least three different types of axles that can be used with LEGO wheels. I can name the first two — Technic axle and Technic pin — but I cannot name the third, which is like a Technic pin, but smaller. Note that I've only seen it integrated into a larger part, such as a brick or plate, as shown in the image. I see that BrinkLink sometimes refers to parts like this as having "wheels holder" pins, but that seems to be a term that could apply to the first two types of axles as well. Does a common and more precise name exist for this type of pin? LEGO and others sometimes calls those pieces a "bearing element". This term however is not limited to just that axle. The width of the axle is roughly equivalent to the width of a "bar", like the 30374 piece used for Lightsabers as such. None of these names are particularly satisfactory, but I'm not aware of any better names. Not the answer you're looking for? Browse other questions tagged piece-information terminology wheel or ask your own question. What are the characteristics of “Miniland” scale? What LEGO wheels would look like the three types used on the JPL Mars Rovers? What are the female parts called? 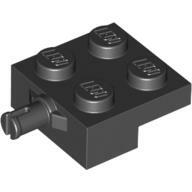 What are the angles used in angle connectors and liftarms? What are the biggest one piece wheel? Firetruck 8289 with different wheels? Are there any wheels or rings that fit in clips?